Hi Everyone! It's Amy here with you today, sharing a sweet, inspirational card. Just a few quick steps and you can create this card in the nick of time! To begin, take a piece of kraft cardstock and fold in half. Trim it town to 5 X 7", this is the base/structure of the card. 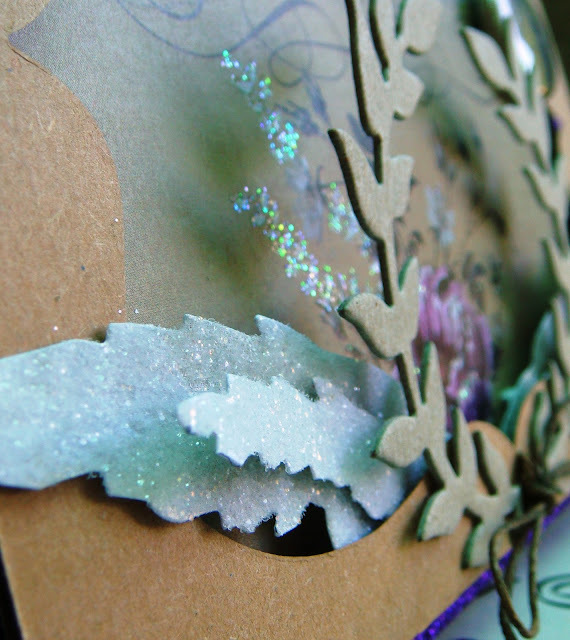 Next, cut a 5 X 7" piece of purple glittered cardstock and adhere directly onto the front of the card. Choosing some fine gift wrap, determine what will be the focal point. The paper wrap I chose to use is from Papaya. It has subtle glittered accents and is so very elegant. Cut the paper down to 4.5 X 6.5", center and staple to card. 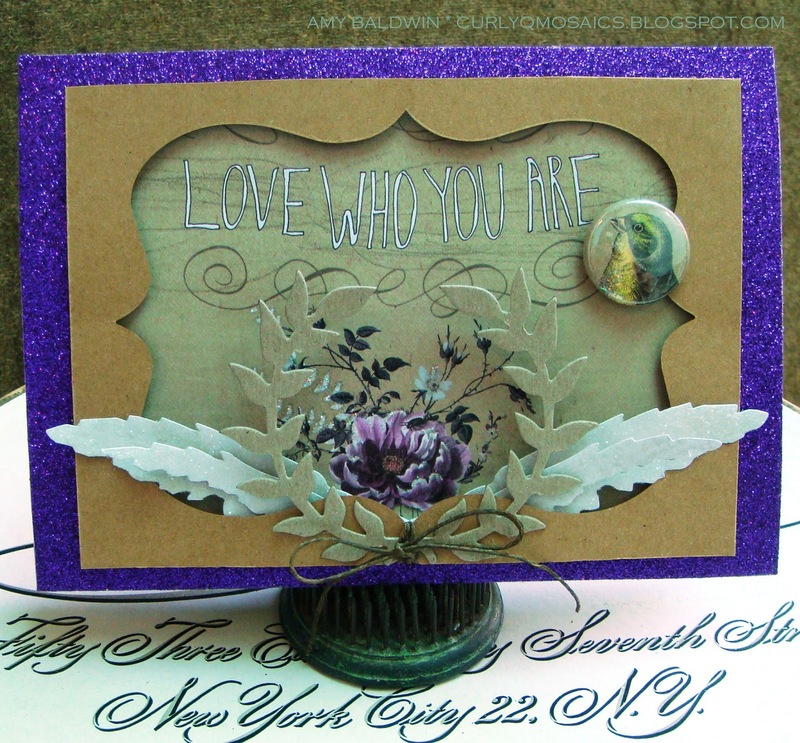 Using the Ornamental die and some Core'dinations cardstock, die cut and remove the center shape. What you have left is a very neat frame with an ornate opening; so perfect to showcase the focal/sentiment of the card. 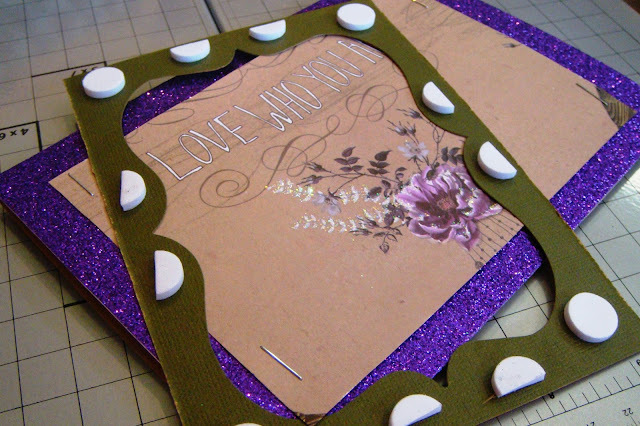 To add some dimension, add foam dots to the back of the frame and then adhere to the center of the card. Die cut the layered angel wings. When cut, this die creates 3 sets of wings in varying sizes. For this card, we only need to use the middle and smallest ones. 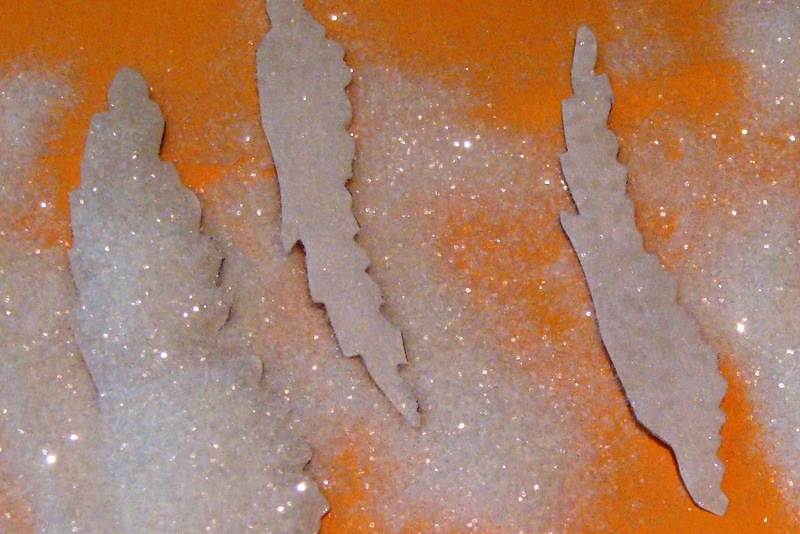 Take both sets and generously cover the surface in Glossy Accents and Tim Holtz Rock Candy Glitter. 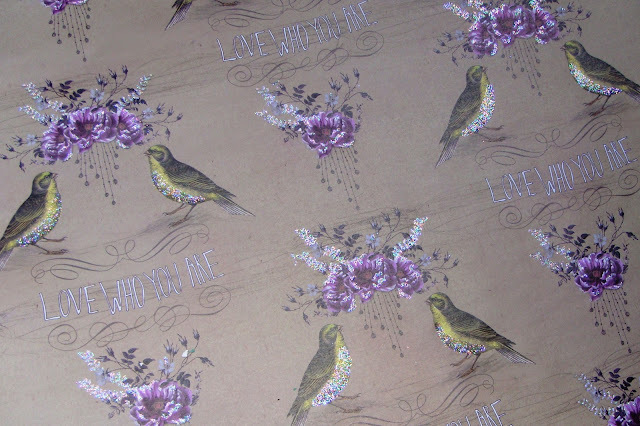 I love this stuff, it is transparent enough to let the paper shine through in a magical way. Set aside to dry. Die cut a laurel leaves wreath out of very thick kraft board using the Regal Crest die. It is important that the laurel leaves are created from a thick sturdy material to prevent bending. As you will see in the finished piece, the laurel leaves "float" at the top. Cut out and create a 1" button from the paper. I decided to create my button using the bird's face. 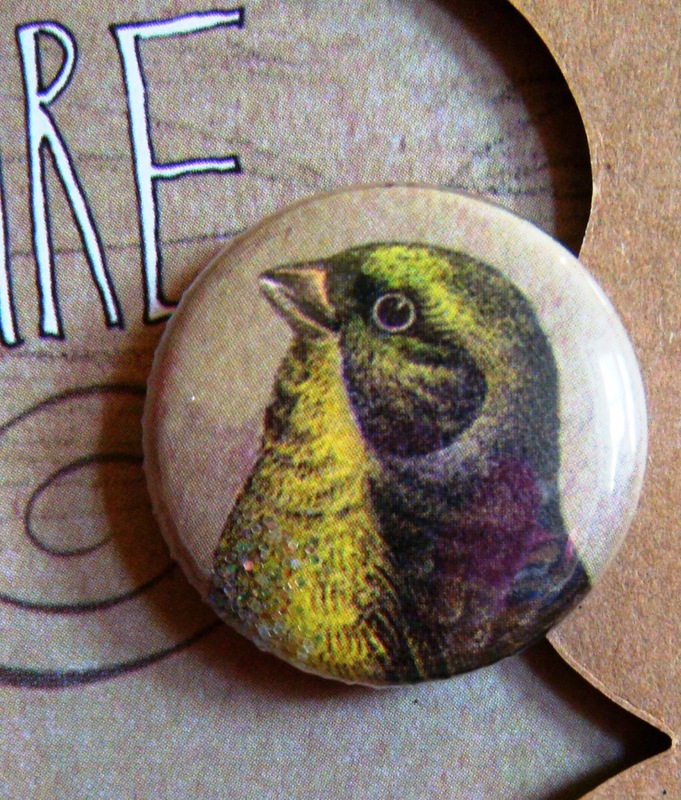 Placing the button just to the lower right allows the bird to draw direct attention to the sentiment, "Love who you are." Once the wings are good and dry, carefully layer and tuck them under the frame. Next, add the laurel leaves wreath on top. 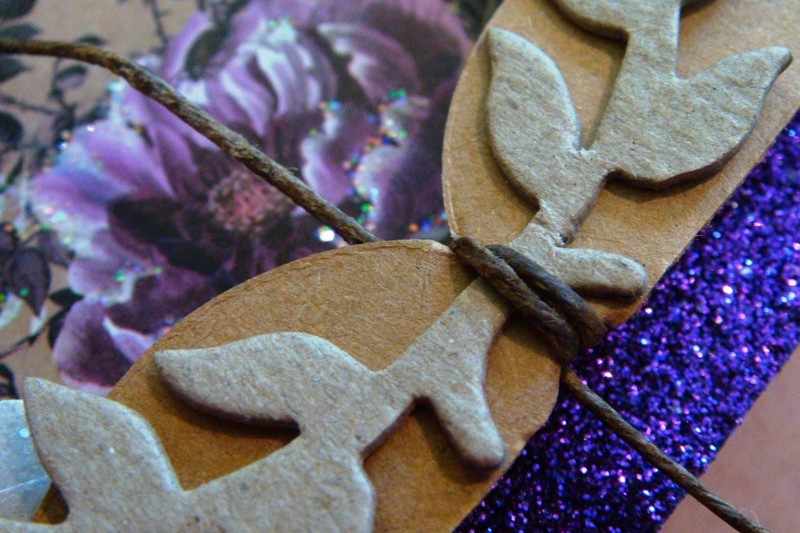 Tie all the elements together using brown wax twine. Create a bow and your done! Are you ready for even more die cutting inspiration featuring the Tim Holtz Alterations collection? 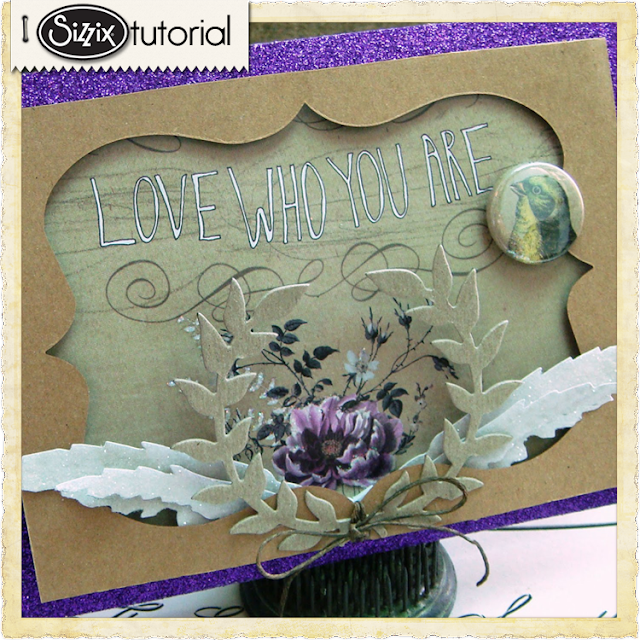 If so, you won't want to miss the Tim Holtz project gallery on Sizzix.com. It is packed with great project ideas and instructions! Beautiful project. I love the idea to use paper wrap. Thank for the inspiration!! WOW! 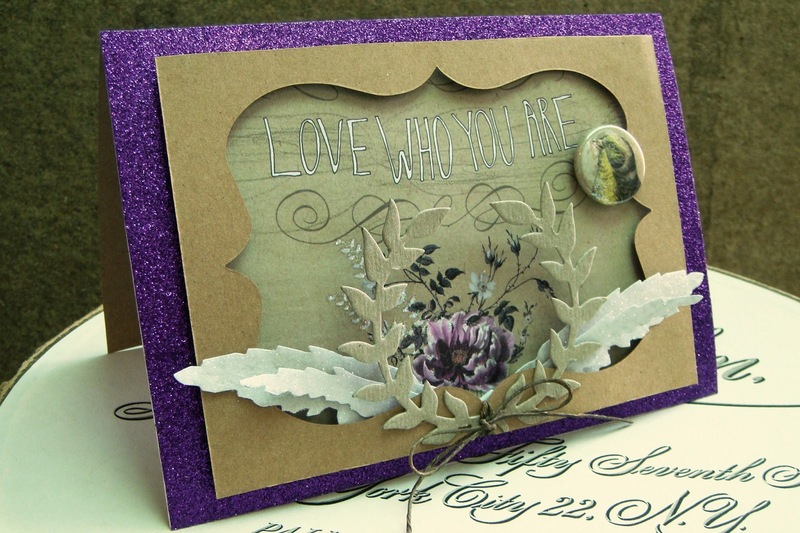 This card is beautiful, the paper and the saying and the layered embellishments really make this card. Thank you for sharing this technique, so many possibilities with this for creating many different styles of cards. The wings die is one of my favourites, now I have a new way of using it. Stephanie Barnard Welcome to the Sizzix Blog! Join me as we discover incredible projects, informative videos and lots of crafty fun! I'm thrilled to have you here! Hello! I am thrilled to be here to share inspiration and ideas with you that I hope will help you take your creativity to a whole new level! Sizzix Big Shot on The Balancing Act! Mother's Day With Pop 'n Cuts! Copyright © Ellison 2012. All rights reserved.. Powered by Blogger.